Tricor’s Preservation Products offer the infrared equipment user a cost effective and convenient product for assisting in the permanent repair of damaged asphalt pavements. Tricor’s one component emulsified oils will restore the light fractions (maltenes) that have oxidized from the pavement. They will also add additional binder if required depending on the product used. The INFRARED process heats the asphalt surface to a consistency which allows for a smooth and level repair to road surface defects such as potholes or temporary filled utility cut repairs. Even severely aged asphalt will soften when heated (about 290 deg. F, 140 deg C) to the flow point of the asphalt cement. INFRARED heaters are able to evenly raise the temperature of the repair area without burning and destroying the serviceability of the pavement. After heating to the proper temperature, the paving mixture becomes fluid and can be raked level and smoothed. 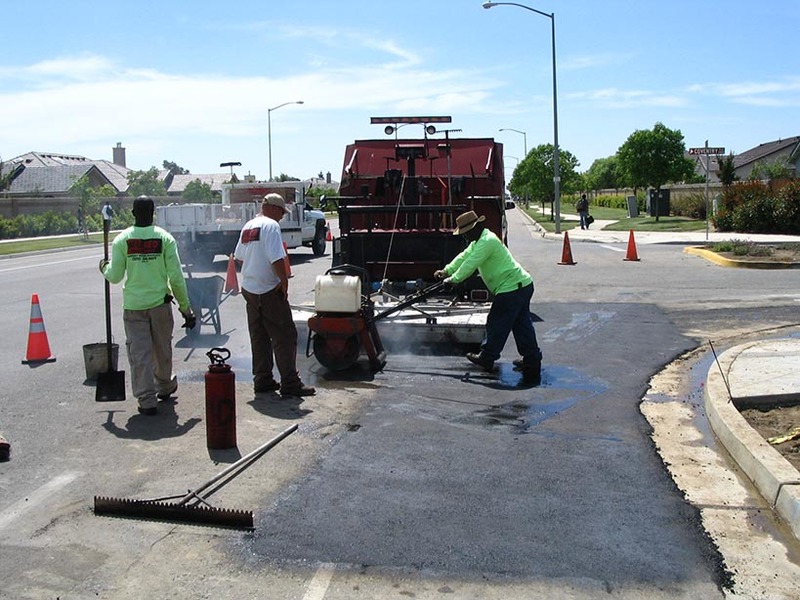 New hot mix asphalt can be added during this process when extra materials are needed to level the repair. This repair process yields a cosmetically pleasing and a smooth drive surface after compaction. The downside is the fact that the reheating speeds up the aging process of the asphalt cement causing it to become more brittle and less able to bind the aggregate and sand in the mix. Spalling and increased tendency to crack are the most apparent symptoms. Asphalt cement (AC) makes up about 6% of most asphalt mix designs, the remaining being aggregate of a variety of sizes depending on the design use of the mix. AC is comprised of asphaltenes and lighter fractions called maltenes which allow the AC to be flexible and increase binding strength. When AC is first heated for a new pavement mix at the hot plant, some of the maltenes are cooked away. This portion of the aging process or “maltene loss” slowly continues after cooling from exposure to wind, rain, ice-melting chemicals and sunlight. This is noticeable by the color change from black to gray to almost off-white as time passes. It is fair to say that this aging process accelerates whenever the AC is heated and this is why binding strength is diminished after a heated repair. The solution is to interrupt aging and rejuvenate the AC by adding new maltenes to replace the light fractions that have been lost. This restores binding strength and flexibility to the pavement. Golden Bear Preservation Products are rich combinations of rejuvenating maltenes and replacement asphalt in an easy to use cationic emulsion. When included in the INFRARED process, the result provides a stronger, more flexible, longer lasting repair without the expense of removing the entire old pavement and replacing it with new pavement. Cyclogen® LE is a maltene based rejuvenator. Cyclogen® ME and CRF® offer rejuvenation as well as the addition of asphalt binder. The rejuvenator or recycling oil is diluted with water prior to use at a 1:1 dilute and well dispersed. The application can be made with a commercial pump sprayer and the dilution can be performed in the sprayer container. The application area includes both the area under as well as the area heated but left undisturbed around the perimeter of the repair. The application shall take place after the area has been scarified and just prior to the addition of new asphalt. Mix the rejuvenator diluted 1:1 at .20 gal/sq. yd or .90 L/sq. m. Rake to mix. Move on to next patch and open road to traffic.